2018 has been hailed a landmark year in Asian representation. Kevin Kwan’s “Crazy Rich Asians” coupled with other hits like “To All the Boys I’ve Loved Before” and even the animated Pixar short “Bao,” have brought actors of Asian ethnicity to the fore of Hollywood. While draped in the American flag, young athletes like Nathan Chen and Chloe Kim catapulted into stardom in the 2018 Winter Olympics. Asian Americans broke ground in the 2018 midterms and gained significant talking points throughout the trial stages of the affirmative action lawsuit against Harvard University this past fall. Against such a backdrop, the sudden rise of the Asian-themed Facebook group, Subtle Asian Traits might seem like child’s play. After all, the viral group deals in perhaps the most millennial language of all: memes. Banter about familiar touchstones of Asian pop culture — from anime to Boba tea — has suffused the posts. Yet to relegate Subtle Asian Traits (SAT) to the teens’ club would be dismissing a complicated network fraught with social and cultural implications. Meme groups are a dime a dozen on Facebook; what Subtle Asian Traits does differently is position the Asian diasporic experience front-and-center. That, at its core, is radical: when was the last time Asians have not held a supporting role in American popular culture? Perhaps the most striking feature about the Facebook group is its staggering magnitude: it has exceeded well over a million members since its creation last September and only continues to grow. It has been the subject of feature articles in the New York Times, New Yorker, and the Atlantic. Subtle Asian Traits has spawned, according to the Atlantic, at least forty other spin-off groups, like Subtle Curry Traits (directed toward South Asians) and Subtle Asian Dating. The Subtle Asian Dating group is designed to be an opportunity for Asian singles to find romantic matches. Subtle Asian Dating (SAD), which operates like a hardscrabble dating app and popularity contest hybrid, has now reached nearly 300,000 members. In the group, eligible Asian bachelors and bachelorettes make their debut (most often through the efforts of matchmaker friends) in a selection of photos and choicely-worded introductions. Some posts, often accompanied by a flood of innuendos and emojis, gain more attention than others — and a frenzy of Facebook tags and comments ensues, as hopeful matches try to “shoot their shot” by social media courting. Although SAD posts are made and targeted for those over the age of the eighteen, any Facebook user can theoretically join with an invitation from a friend in the group or acceptance by one of the admins. As a result, some high students have joined the group, primarily as farce. “I don’t think any of my friends use SAD seriously, but we all do jokingly tag each other on the auction posts. Both SAT and SAD have definitely made me closer to all of my Asian friends. It’s always a conversation starter,” senior Reyna Choi said. But the most liked posts in the group often are more nuanced than slapstick humor: they translate (sometimes literally) memories and experiences woven into the diasporic experience into self-aware wit. “Memes express a culture’s belief, they tell its stories, they pass along these narratives from person to person,” Dr. Justine Humphry, a University of Sydney lecturer said to the New York Times. RM students in the Facebook groups have largely found them to be engaging interfaces. “I think it’s a fun community to be a part of where you can just share laughs with people who’ve had similar ‘Asian’ upbringings,” senior Justin Song said. Other RM students have derived from the groups a heightened awareness of what it means to be an Asian Gen-Xer in America. “It’s changed my cultural identity by making me realize how similar my lifestyle is to many others, and so I have felt more included and confident about myself,” junior Cathy Yung said. The content featured in SAT and SAD are catered primarily to teenagers and young adults, but even within this age range, members come from all backgrounds and parts of the world. “Despite there being more than a million people in the group, when I see all these comments with friends tagging each other in posts that I personally resonate with, I feel like we can all relate to each other one way or another,” senior Daisy Liao said. Choi finds a similar spirit of camaraderie while scrolling through the group’s feed. “In my eyes, the different Asian races were all pretty separate. Sure, we were all Asian, but I still felt somewhat disconnected from my Chinese or Japanese friends when it came to Asian culture. When I found SAT, we all started banding together to translate memes for each other. I’d tag a friend that speaks Mandarin and he’d explain a joke to me, and he’d tag me in a post that uses Korean,” Choi said. Despite all the controversies Facebook and its founder, Mark Zuckerberg, have faced throughout the past year — dealing with serious, heavy-handed questions of political misuse and personal privacy in the digital age — meme groups like Subtle Asian Traits reel users back onto the platform. “It’s honestly flooded my Facebook timeline. 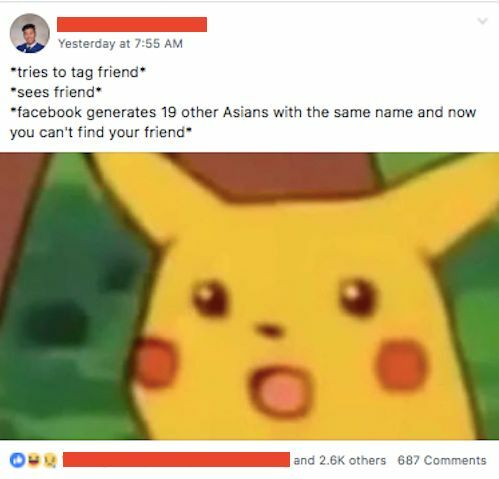 I see my Asian friends from all different parts of my life tagging each other, and a bunch of friends that I know from different places will all tag me in the same post as well. I definitely spend a lot more time on Facebook now,” Choi said. Ultimately, Facebook groups like SAT and SAD are steered by the whims of its users. SAT’s creators, nine first-generation Asian Australian friends, founded the group this past September to exchange stories and jokes about their coming-of-age experiences with a foot in two cultures; some have questioned whether the group has deviated from its initial “family” label. Senior Layna Lu points to the inherent challenges of such a vast community; some posts have been accused of perpetuating racial insensitivity and misogyny. “Since there are a lot of diplomatic tensions between some of the asian countries, it’s cool that a lot of people were coming together to meme about our Asianness. Yet there remains a tendency to overgeneralize Asians to be Chinese, especially since Crazy Rich Asians was also primarily Chinese,” Lu said. Senior Ananya Krishnan is a member of Subtle Asian Traits, but as an Indian American her enjoyment of the memes and cultural posts were complicated by what she notes as a bias toward East Asians. “It can sometimes feel a little isolating and exclusionary when some of the posts are in Chinese or about East Asian food. Often times the pictures feature only East Asian people,” she said. To put it more bluntly: Subtle Asian Traits and Subtle Asian Dating are messy, fragmented narratives of millennial vanity. Subtle Asian Dating, by “auctioning” off veritable bachelors and bachelorettes through a medley of photos and humorous pro and con lists to a tag-hungry of young adults and their friends, may be feeding into the dangerous norm of seeking beauty at face value. SAT posts often pander to Asian American stereotypes, capitalizing on tropes about tiger moms and a relentless push for academic success. They sideline South Asians, who have long been swept behind the relatively more visible umbrella of Chinese, Korean, and Japanese identity. The opportunity for a largely millennial audience to find a community in which their own identities are celebrated in full force is rare; the SAD platform, in forgoing popular fetishes of Asian women as submissive and Asian men as effeminate, is thus refreshingly empowering. In a testament to the power of the Internet community, one member, reflecting on a conversation with a nameless stranger in Switzerland years prior, sought help from the Subtle Asian community to find this stranger by posting a single picture. SAD members were able to find him overnight. Whether the success of such an endeavor is unsettling or miraculous may depend on the perspective of the beholder; nevertheless, it serves as a clear reminder that the platform is not only an opportunity to reminisce about Saturdays spent at Chinese school or lament about strict Asian parents, but also a chance to harness the power of human connection — as ephemeral and facetious as it may seem. For all of its faults, Subtle Asian Traits is irresistible: it is irresistible for its youth and novelty, for its enormous, unprecedented reach, for its ability to gloss over differences and find small fragments of Asian diasporic identity that thousands of its members may remember as their own.